The wealth disparity in the United States is astonishing, yet many have come to accept it as almost natural. In his new book, Dean Baker debunks the inevitability of this disparity, exposing the economics of a rigged system and offering hope to those who want a global economy that works for everyone. 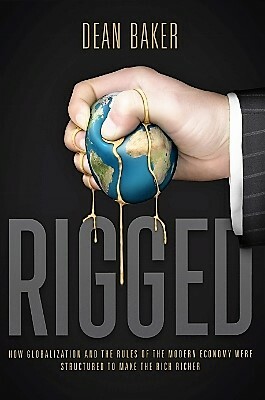 Get your copy of Rigged by making a tax-deductible donation to Truthout today! The following interview with frequent Truthout commentator and economist Dean Baker (of the Center for Economic Policy and Research) drills deep into the fiction of capitalism being an economic system that anyone can prosper in with the right skills. Mark Karlin: Why is it a neoliberal fiction that “job loss and stagnation faced by manufacturing workers in the United States and other wealthy countries was a necessary price for reducing poverty in the developing world”? Dean Baker: I don’t know that I would call it “neoliberal” fiction, but it is definitely fiction. First, the story turns standard trade theory on its head. Capital is plentiful in rich countries; it is scarce in developing countries. This means that capital should flow from rich countries to developing countries. This would mean that rich countries like the United States would be lending poorer countries the capital they need to grow. In this story, rich countries like the United States run trade surpluses with developing countries. Instead we have seen the opposite story over the last two decades. Developing countries have been lending large amounts of capital to rich countries, especially the United States. Much of this has taken the form of developing countries buying dollar based assets to be held as reserves by their central banks. This is actually a change in behavior that followed in the wake of the East Asian financial crisis in 1997. Prior to the crisis in 1997, trade did follow the textbook model with developing countries, especially those in East Asia, borrowing large amounts from rich countries. Contrary to story told in mainstream circles, this was actually a period of much more rapid growth for the developing world, or at least the East Asian countries. In other words, the successful countries in the developing world were actually seeing much more rapid improvements in living standards in the years from 1990 to 1997, when they were running trade deficits with rich countries than in the years since 1997 when they were running trade surpluses. So, the answer is “no,” we don’t have to throw manufacturing workers in rich countries on the street in order for poor countries to grow. It is also worth noting that we have largely confined trade to manufacturing goods. The same argument for gains from trade would apply to professional services, physicians’ services, but we have major barriers to such trade. For example, foreign doctors are prohibited from practicing medicine in the United States unless they complete a U.S. residency program. As a result, our doctors are paid twice as much as doctors in other wealthy countries (more than $250,000 a year on average, net of malpractice insurance and other expenses). This costs the country almost $100 billion a year in higher health care costs (at $700 per family, per year). The fact that we actively seek to put our less-educated workers in direct competition with low-paid workers in the developing world, while protecting our most highly educated workers, is a major factor contributing to inequality. We also could structure such trade to ensure that poor countries benefit by paying them for the professionals that come to the United States. The US would still come out way ahead if it paid developing countries enough to train two or three doctors or other professionals for every one that comes here. On this issue it is also worth noting that we already get a substantial number of professionals from these countries and provide zero compensation. So a deal that increased the flow, but provided compensation, would in almost all cases make developing countries much better off. It is also important to note that stronger and longer patent and copyright and related protections have been a central part of recent trade deals. These protections are the opposite of free trade. And they have made it far more expensive for people in developing countries to buy drugs, software and other products. In short, the line that manufacturing workers in the United States and other rich countries had to take a hit for the benefit of the world’s poor is utter nonsense. It is just something that the elites can say to make themselves feel better about screwing workers. Why does the myth of a “free market” as compared to a “structured market” continue to exist as conventional wisdom in the US financial world and DC? It is obvious why the rich would promote this view. It sounds much better to say that “I got rich because of my talent and hard work” than to say “I got rich because people like me used our political power to stack the deck in our favor.” Some variant of the talent and hard work story is the predominant view on the right. Among liberals I think it is more self-satisfying to accept a variant of this view as well. After all, most of the people setting the agenda for liberals are among the winners. To these people it likely feels much better to say that “my talent and hard work allowed me to get ahead, but I feel bad about the losers, so I want to help them, too” than to say the system was rigged and I was lucky enough to be among the winners. There also is a reluctance to think differently. We often joke that intellectuals have a hard time accepting new ideas. Unfortunately it is close to accurate. Even well-established academics are much more likely to accept an idea from an academic with high standing than a person with less standing, no matter how compelling it might be. I got to see this up close during the housing bubble years. I was doing everything I could to warn people about the bubble. To my view, the evidence was about as clear as it could possibly be. We had an unprecedented run-up in house sale prices even as rents were going nowhere. The vacancy rates had already hit record highs as early as 2002. (They went still higher as the bubble grew larger — not a story consistent with a housing shortage driving up prices.) And, the bad loan practices that fueled the bubble were hardly a secret. They were frequently joked about in the business press. Anyhow, I was asking Ph.D. economists to just use some simple arithmetic and common sense in recognizing the housing bubble, but was able to make essentially zero headway. So asking them to think in a fundamentally different way about the way markets work is really a huge lift. Can you identify the five major causes of income redistribution upward in a “structured market” that you detail in your book? a) High unemployment is probably the most important one. We have pursued macroeconomic policies that have kept the unemployment rate unnecessarily high over the last four decades, often deliberately, as seen when the Federal Reserve Board raises interest rates to slow the economy. High unemployment weakens the bargaining power of workers, especially those at the middle and bottom of the wage ladder. Also, the losers in this story are disproportionately African Americans and Hispanics. b) We have pursued a policy of favoring the financial sector in various ways. This is often wrongly called “deregulation.” It isn’t. The sector was almost unanimous in supporting the Wall Street bailouts of 2008-09. They also are happy for federal deposit insurance and the backstop provided by the Federal Reserve Board. Essentially they want insurance without having to pay for it. They also enjoy exemptions from the sales taxes that hit most other sectors. A modest sales tax in the financial sector (a financial transactions tax) would raise over $100 billion a year by eliminating a huge amount of waste in the financial sector. This “waste” is the income of many of the highest paid people in the country, specifically hedge fund managers and traders at major Wall Street banks. c) Patent and copyright protection both shift an enormous amount of income upward. In the case of drug patents alone, we spend more than $430 billion a year (2.3 percent of GDP) on drugs that would cost 10-20 percent of this amount in a free market. We do have to finance the research and development of new drugs, but there are far more efficient mechanisms to do so, which I describe in the book. There is a similar story with copyright protection. People may still be willing to pay lots of money to hear Taylor Swift in a world without copyright protection, but my guess is that the big stars and their promoters would earn far less than they do today. d) We have a broken corporate governance system. As it stands, the corporate directors, who are supposed to serve shareholders, are largely beholden to top management. (More than 99 percent of directors get reelected.) As a result, they are willing to sign off on outlandish CEO pay packages. The result is not just bloated pay for the CEOs themselves, but also those standing close to them in the corporate hierarchy. And, the bloated pay packages spill over to the top executives at universities, foundations and other nonprofits. e) While we do everything possible to strip away labor market protections for those at the middle and bottom of the wage ladder, we keep in place the protections for the most highly paid professionals, especially doctors and dentists. As a result, doctors’ pay averages more than $250,000, putting many in the richest one percent of the population and almost all of them in the richest three percent of households. We should look to remove these barriers, opening them up both to more foreign competition and also competition from lower-paid professionals like nurse practitioners and dental hygienists. How are professionals, e.g. physicians, protected from the impact of globalization? I partly dealt with this earlier. If we approached these professions the way we treated other sectors, we would be looking to determine clear standards for ensuring competence and then making it as easy as possible logistically for people in other countries to train to these standards and then work in the United States, just like someone who was born and trained here. In the case of physicians, it could mean certifying foreign residency programs as meeting our standards so that graduates would be able to work in the United States. It also would mean that testing could be done in foreign countries (by people authorized by the United States government), thereby reducing the cost of test-taking for students who may not have much money to travel. This should not sound like a huge leap. The European Union has managed to set such professional standards for its 28 members without widespread problems. How are patent and copyright monopolies an “inequality scam”? It is important to recognize first that these are forms of protectionism (i.e. not the free market) and are just one possible mechanism to support innovation and creative work. These monopolies have all the downsides of any form of protectionism, except the economic costs are far worse because they are so much larger. Economists will usually go into hysterics over the prospect of a 20 percent tariff on an item. The hepatitis C drug Solvadi has a list price of $84,000. A high-quality generic version is available in India for less than $200. The patent that allows for the high price in the United States is equivalent to a tariff of 40,000 percent. This has the predicted effect of encouraging drug companies to misrepresent the quality of their drugs and promote them for inappropriate uses. They also have incentive to conceal evidence that [the drugs] are harmful. And, many people can’t afford the drug at its $84,000 price that would have little difficulty paying $200. This latter aspect is especially pernicious since we are talking about something that is essential for people’s lives and health. This is equivalent to asking people to pay firefighters at the point when they show up at their burning house with their family inside. No one would think this makes sense as a way to compensate firefighters (it would make some very rich), it makes even less sense as a way to support drug research. We should be looking to take advantage of new technologies by allowing innovation, as well as creative work, to move as freely as possible. Patent and copyright monopolies block these flows and redistribute income upward in the process. What is your reaction to the Trump-Pence corporate subsidization of keeping less than half of current employees at a Hoosier Carrier manufacturing plant? We don’t yet know the details of the taxpayer-funded inducements used by Pence and Trump — and the interest of Carrier’s parent company, United Technologies, in maintaining billion dollars in defense contracts — but why is this whole model impractical on any large-scale level? Learn how globalization and the rules of the modern economy were structured to make the rich richer. Trump and Pence put on a show. It was great political theater, but the answer to job loss isn’t to have the president personally haranguing individual companies, it is to put in place policies that take away the incentive. Top on this agenda should be getting down the value of the dollar to make US goods and services more competitive internationally. Also, to protect our workers we should follow the path of every other wealthy country and put in some system of severance pay. For example, workers can be mandated two weeks of pay for every year they work. This means that a worker who had put in 25 years at Carrier would be entitled to almost a year’s worth of pay if they decided to move the factory to Mexico. This would be a substantial disincentive for moving. It would also encourage companies to train workers and modernize their facilities, since it would be costly to dump them. On the other hand, if there were very large savings from closing an unproductive factory, a modest system of severance benefits would not prevent them from doing so. It would also provide workers with money to lessen the burden of losing a long-term job. Anyhow, this is the sort of direction policy should take, not a case-by-case haranguing from the president. In the wake of the most crippling economic downturn in 70 years, free market mythology is reaching its limits. Our culture systemically devalues things that have no price, such as caring for others and political participation.